Harvest Mouse Macro Workshops are an amazing opportunity to photograph these tiny, challenging but fascinating little creatures in a studio environment at Liberty’s Centre near Ringwood. Your day will start with a quick introduction before we start photographing the mice using a variety of props and backgrounds and will last for two and a half hours. As always an experienced photographer will be on hand to guide you and help out with any questions that may arise during the session. As with all our animals the health and wellbeing of our mice always comes first and we do not force them to do anything they don’t want to do or put them in harms way with anything that might cause them distress. You are welcome to bring any props that you might want to on the day but please be aware that these will be checked for safety before being used. Being indoors these days are not weather dependent as well as having the added advantages of using our professional quality lighting to achieve the best possible picture quality. Typically we will be shooting at small apertures for increased depth of field, low ISO for ultimate picture quality and lightning fast effective shutter speeds to minimise any movement blur or camera shake giving you absolutely stunning results. Each session is limited to just 3 photographers so there is plenty of space for all and plenty of time to get your photographs. Sessions last for two and a half hours and cost £55 per person per session. Your day includes entry into Liberty’s Centre so if you wish to stay in the Centre after a morning session, or arrive early for an afternoon session, to have a look round at our Birds Of Prey and Reptiles that reside with us you are more than welcome. Recommended Camera Equipment: You will need a DSLR camera, Compact System Camera or a high end “bridge” camera that is capable of being set to manual exposure with the ability to control ISO, Aperture and Shutter Speed. We suggest that if you are unfamiliar with the controls you check your camera’s instruction manual before your day. For cameras with electronic view finders it would be helpful to be able to turn off “exposure simulation” if possible. Lenses we recommend are either a macro lens of around 100mm focal length or a zoom lens of around 70 – 200 or more focal length. Some Sony cameras use a non-standard flash hot-shoe fitting that will require you to bring a flash adapter to use our triggers. (Adapters can be found on Amazon and Ebay quite readily). We supply a range of “standard” props such as wheat stalks, teasels, poppy heads and a variety of twigs – if you require specific props such as flowers we would suggest that you bring them with you. 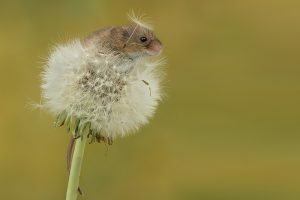 Cost: Harvest Mouse Macro Workshop days are charged at £55 per person comprising of a non-refundable £15 Deposit at the time of booking with the balance payable on arrival on the day using either cash or card. Private Days: Private days are available at a cost of £200 per session for up to 4 people (2 is ideal). Week day bookings are also welcome – please contact us with your requirements. Club bookings please contact us on 07899 700800 with your requirements.